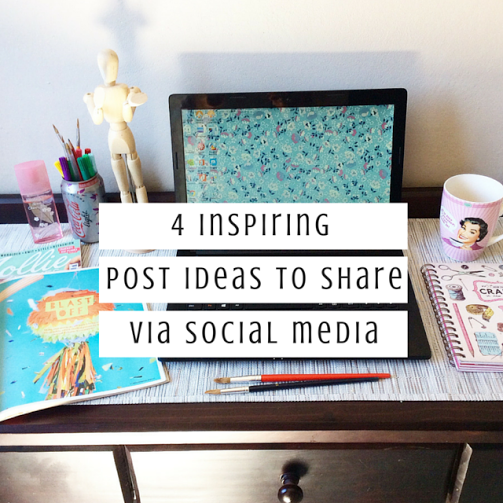 Today's post is all about delightful + inspiring post ideas to share on your social media timelines. Now this does not have to be tricky. Just think... Have you ever noticed how your eyes lit up when you see a bright little "Hello there, hope you have a great day" post? It might seem simple but a short + cute post like this will make your readers feel appreciated and special, especially nowadays where everyone's sole purpose is to sell things to you. Another important point is the fantastic effect of one or two good posts during the day with a quality image at peak times. Let's say early in the morning when your tribe are having their first cuppa and then around, let's say 15:00 again. Social media can be a tricky thing sometimes, you don't want to bombard readers with a whole lotta info and you also can't just drop of the radar. I've noticed how some individuals have mysteriously disappeared from Facebook, while Google Plus have become a complete + utter ghost-town. Scary stuff hey? If you are still doing your own social media (hey, why don't' you use me?) you can log into your Facebook account and schedule it right there, if you take your business serious (yep, I know you do) you can make use of Hootsuite's free service to access all your social media platforms. There's a whole lotta amazing things to share via social media, besides your well-written blogposts or brand products. Here's a few of my all time my faves. 1. Pictures of your outfit of the day, also referred to as #OOTD. You don't have to be a fashion blogger to share this type of post, I mean everyone want's to look and feel pretty, right? Mix this up with your fave lipstick and other beauty products, either on your bed/couch or all dressed-up! Instagram's kinda popular for these type of shares. Having a creative business + meeting clients and looking good goes together like peanut butter and jelly or vanilla ice-cream with chocolate sauce, whichever you prefer. You can't expect to be a mover and a shaker if you don't look like a mover and a shaker. Got it? Gooood. 2. Branded images. This is an awesome idea if you want to take your small business to the next level. And it's soo easy. All you need is a good background along-with an inspiring quote and your brand's logo/website. If you need help give me a shout. 3. Good humor. I particularly love illustrated tech humor where folks make fun of outdated devices like floppy disks or audio cassettes. I'm also fond of all those caffeine addict jokes, let's admit it some days good-old coffee's really all you need to kick-start the day. (Eek, sorry green-juice.) Whatever your product or brand, there must be something to have a little giggle about. There are lovely boards over at Pinterest where you can have a look-see at images that suits your brand. 4. Behind-the-scenes photos. This is a great way to show off your latest office decor from Mr Price Home or Typo and even more fabulous if you have product launches, creative workshops or training sessions with your clients. Also a lovely way to include readers into your daily routine. A fabulous idea is to have a special little blog/brand notebook where all your post ideas for the week/month goes in, this way you won't get lost in a maze of words, it has happened to me in the past, true story... Until next time!